Early in the morning of August 26, 2018 we are blessed with a Full Moon in dreamy Pisces countered by the Sun in healing Virgo. 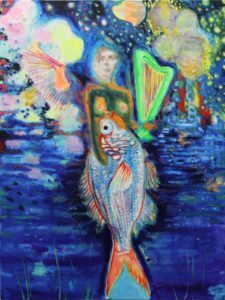 Pisces wants us to open our heart & our mind to our divine creativity. Virgo asks us to balance & bring together our body, mind, & spirit in wellbeing through practical means. After all the recent turmoil (eclipse season & the excess of planets in retrograde) we are gifted a sweet celestial balm in this lunation to ease us through. The Sun shines its light on Virgo issues now; health, work, nutrition, community building, & the environment. We are asked to question our sense of identity & strengthen our connection to each other as we release assumptions & presumptions. This is the time of harvest, of culmination, birthing, & abundance. Virgo energy is focused on action, truth, & completion. The Moon illuminates Pisces gentle attention on our spiritual connection & inner search for understanding. It is the sign of the dreamer, fantasy, & the imagination. We feel an urge to create, get inspired, & appreciate beauty as we let ourselves manifest into the world. The desire to integrate spirit into our daily lives compels us to meditate, create ceremony, get out in nature, & be grateful. Pisces energy is immersed in feeling, believing, knowing, & giving. Make the effort this weekend to reflect on your inner longings & let this lunation highlight the steps needed to bring these inspirations into reality. As these energies mingle & join we are encouraged to recognize that we can achieve anything we can dream. Spend some time indulging your creativity & embodying your divine essence in the light of the Pisces Full Moon.